This project aims to generate the data to statistically validate analytical and numerical models used to describe the motion of rocking structural systems excited by earthquakes. 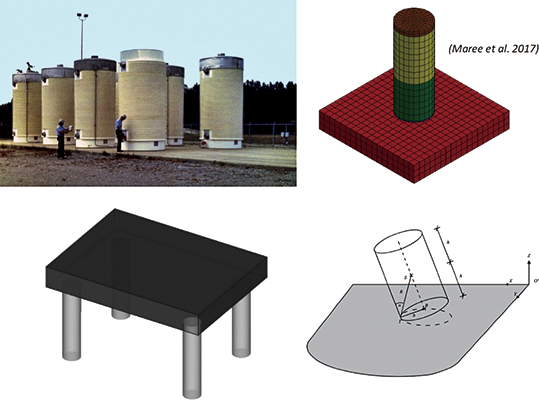 Even though rocking models have been used in practice to evaluate the seismic performance of structures and non-structural (but essential) equipment that uplifts and rocks, there is a consensus that these models are not validated: Rocking motion is very sensitive to the initial and boundary conditions, as well as the excitation, and is highly non-linear. To date, all of the attempts to deterministically match the numerical and experimentally measured time histories of the response of rocking blocks to earthquake excitations have failed. Very recently the applicants showed that even though predicting the entire time history of the response of an object rocking in-plane is practically impossible, the well-known 1963 Housner model can predict the statistics of the response to an ensemble of specifically selected ground motions quite well. They argue that such statistical model validation is relevant to earthquake engineers, since the ground motion that is going to excite the prototype structure is now known a priori; what is known are the statistical descriptions of some of the properties of ensembles of such ground motions. As the 3D rocking motion is even more sensitive than the planar one (experiments have been reported to be non-repeatable), the statistical validation of 3D rocking models is more challenging. Moreover, another challenge is the joint statistical characterization of the three orthogonal ground motion components and appropriate generation of the ground motion ensemble for the tests. This project aims to use the 6DOF shaking of table of University of Bristol to validate two classes of 3D rocking specimens: One related to essential equipment and one related to the recently suggested concept of rocking isolation of bridges. The expected outcomes of this project are: generation of an experimental dataset to statistically validate a variety of 3D rocking models; validation and uncertainty quantification of a 3D extension of the 1963 Housner model; and conceptual development and implementation of a statistical validation and verification procedure appropriate for models of seismic response of structures.